Those creations were great and we posted many of them on our Facebook page. But we wanted to go a level deeper to really understand how the 3D Printer Lab has affected our students. And we decided the best way to do that was to find the most prolific 3D Printer user in the school and ask him. Enter, senior Chris Davekos, the most prolific 3D Printer user in the school. We got Chris' name from high school math teacher and Edfund Board Member, Joe Maher. Though a math teacher, Mr. Maher was quite aware of Chris' interest in 3D Printing. We contacted Chris and got more than we expected. Much more. "At first I had no knowledge of 3D printing at all." For Chris, the idea of 3D printing was entirely new. One day Mr. Walsh, his Fab/Tech teacher (and the teacher who requested the grant along with Mr. Shippen), excitedly announced to the class that his grant proposal for a 3D Printer Lab had been approved by the HW Edfund. Chris thought it sounded pretty cool. Then the printers arrived. "I watched tutorials on YouTube." 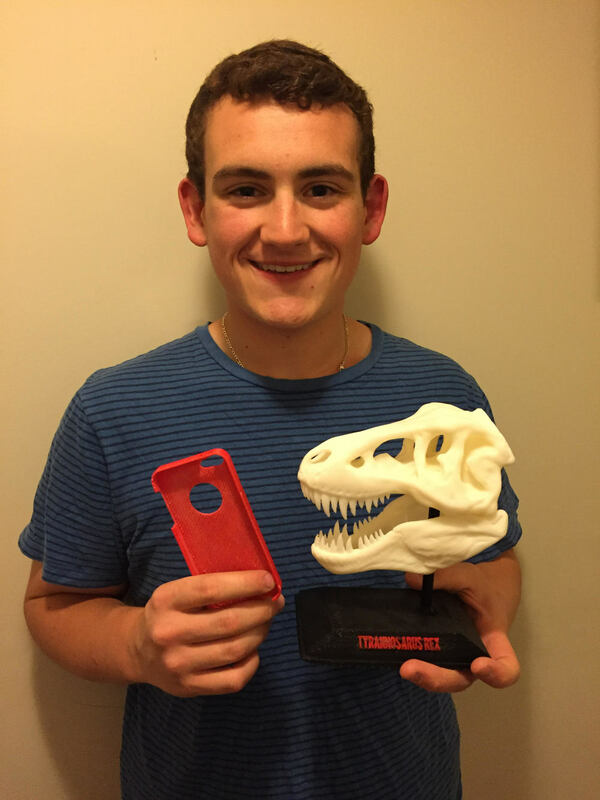 Chris was so inspired by the possibilities that a 3D printer presented to him that he started spending his personal time figuring the technology out. He went on YouTube and watched video tutorials. 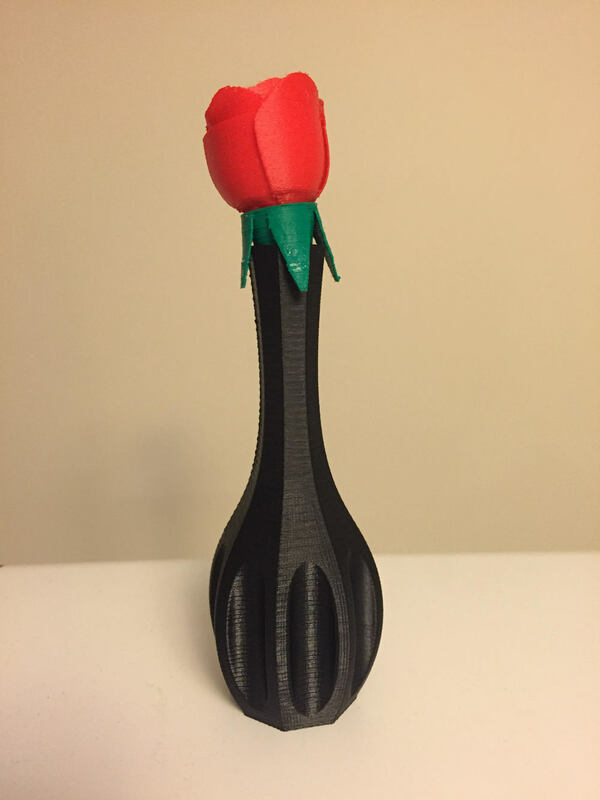 He downloaded and taught himself how to use a software program, TinkerCAD, that to Chris was better and easier than the program that came with the printers. He found web sites where files of CAD (computer assisted design) drawings could be downloaded, manipulated, and then printed. He got really good at it. So good his friends would send him their own files for Chris to print. So good his Dad went out and bought him a 3D printer for Christmas to use at home. So good Mr. Walsh asked Chris to become an official "Assistant" in the 3D Printer Lab. Chris was designing and printing amazing things. His friend's Jeep had a couple climate-control knobs missing, so Chris designed and printed new ones that fit and worked perfectly. He and his Dad designed a glow-in-the-dark 3D pillbox so the pills could be more easily found at night. 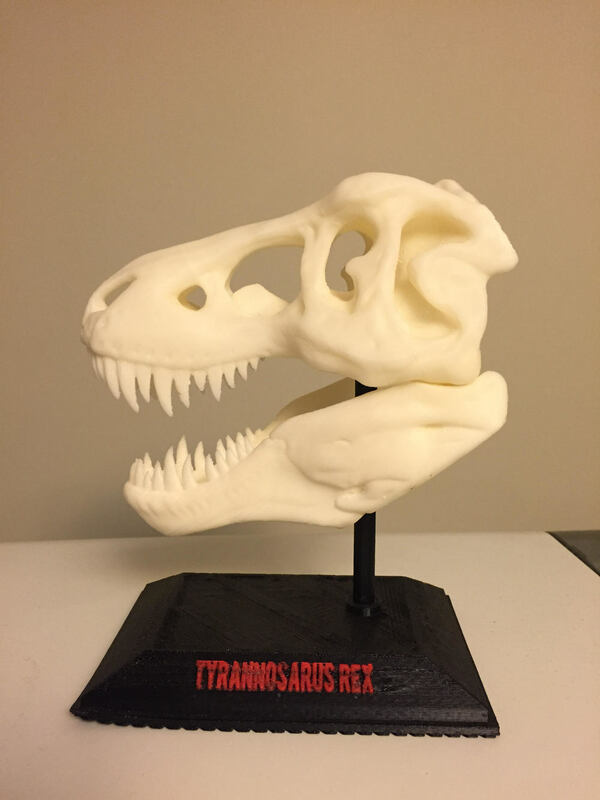 He created a UV light sponge cleaner, a custom smartphone case, a shift knob for the manual shift in a car, A Tyrannosaurus Rex skull, a human skull, and a human bone printed to scale (Chris thinks it was a femur) and that he gave to his anatomy teacher. "It completely changed the way I look at the future." Chris was empowered by this new technology saying that it opened doors for him. He plans to be a teacher himself one day and says he'll always have a 3D printer "around somewhere" in his life. I would thank the Edfund for the grant they gave to the high school for the 3D printing Lab. Not only was my senior year impacted by the 3D printers, but my entire outlook on technology and innovation was impacted. Seeing this technology in action is an amazing sight. Having the opportunity to work with the printers and learn about them is something that I greatly appreciate and know many students down the road will appreciate too. They even inspired me to get my own 3D printer, which I will be taking to college. Friends, donors, members of the Edfund Board, this is what we live for. This is what the Hamilton-Wenham Edfund is all about. It's why we exist. And it's why our donors donate. Yes "We grant advantage," as we like to say at the Edfund. But it's so much more than that when we see the advantages we grant actually change students in such profound ways. Like the 3D Printer Lab did for Chris Davekos and countless others. Chris is heading to Salem State next year. We wish you luck, Chris. And do keep us posted on what you print next! To make a donation to the Hamilton-Wenham Edfund, please click here.